Candles play a major role in the celebrations during Christmas. Candle lights are associated with Christmas from ancient times representing the star of Bethlehem. This tradition is being carried forward till now to remember the importance of candles for the season. Sparkle up the Christmas celebrations with the candles and make it look more attractive and beautiful with these cute candle holders. TRADITIONAL TOUCH – Antique and vintage pieces will bring in timeless beauty to your home décor. The vintage brass candle stick pair, ornate crystal candelabra, designs would depict the Christmas tradition and double the beauty of the décor. 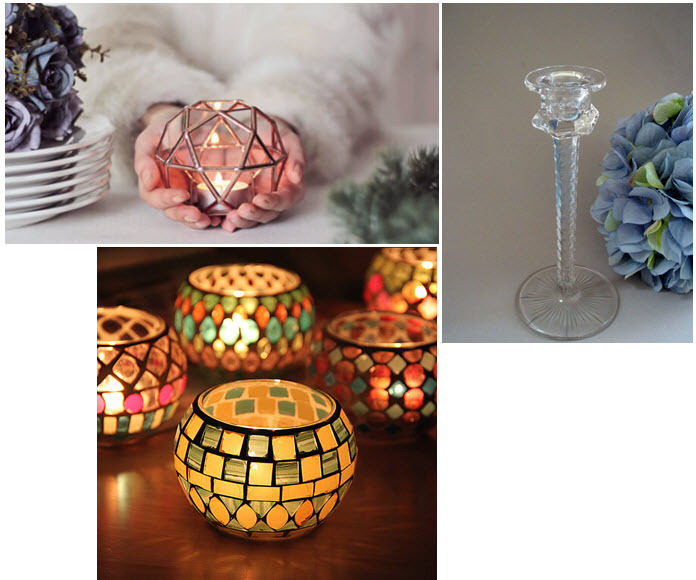 Energize your loving space with these ever fresh, bright and beautiful candle holders. MODERN MAGIC – Add an elegant glow to the décor with stylish modern candle holders. The modern spherical holder, Oleg Cassini crystal floor standing holder is the perfect input to spruce up your home for Christmas. Just pick these holders to season up your magical moments for the holiday. WALL WONDERS – Candle holders when mounted on wall spreads an amazing shocking beauty to the room. The golden candle sconces, iron plus flower sconces are perfect for any space at home and are warm gifts to your loved ones for the season. The cute wonders on the wall is sure to fetch the attention and love of your family and friends. GORGEOUS GLASS – Glass holder sets an instant ambience and add a splash of glam to the décor. The glass mosaic holder, led cut crystal tall holder, geometric candle holder looks great and fine tunes the beauty of the décor. Enhance the celebrations for the season with these classy glassy beauties. CHARMING CHANDELIERS – Chandeliers are the perfect centerpiece to fill the room with luxurious beauty for any occasion. The wrought iron chandeliers can be hanged and even table topped with glass holder to bring romantic lighting indoors and outdoors. Never miss this if you have plans for a surprise Christmas dinner with your lady love. ULTIMATE UNIQUENESS – Stand out in style and uniqueness while decorating your pretty space for the season. The bird nest holder, bronze silver finish butterfly holder is really uncommon in its looks which will attract and stand out from the rest. Bring in a thrilling unique beauty to brighten up the décor. DECORATIVE DIY –” DO IT YOUESELF” – any creative idea would give a unique look to your décor. DIY is as tasty as homemade food, specially made with lots of love and care. 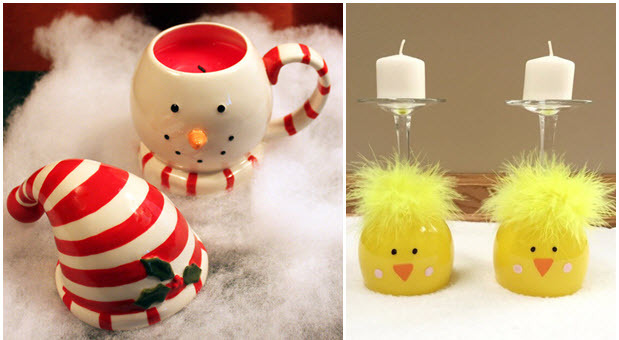 So, bring in endless DIY ideas like the wine glass holder, snowman cup holder, coffee bean candle cup to create a heartwarming atmosphere at home for the festive season. A unique stand would add to the beauty of the candle placed on it. These lovely holders with lighted up candles would complement any space at home during the festive season. 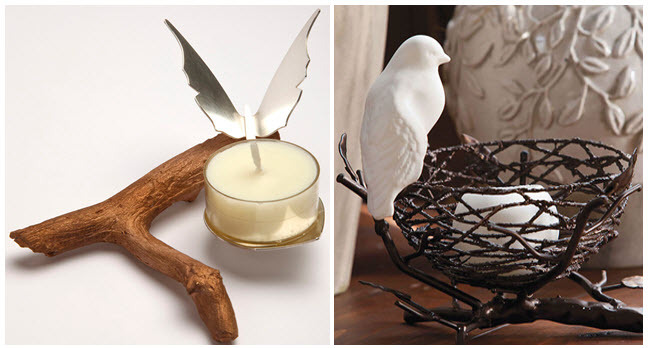 Create a bright impression to your décor with these unique candle holders. If you come across any lovely designed candle holders, do click and send it to us so we can add it to our list.